McCOY’S FISH SHAPED PLATTERS ARE VERY DIFFICULT TO FIND – ESPECIALLY FROM THE BROWN DRIP DINNERWARE LINE! 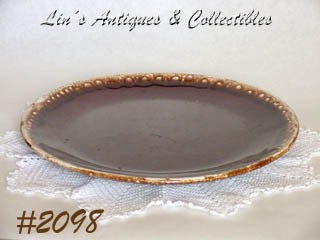 THIS LISTING HAS THE LARGE SIZE PLATTER (MATCHES OUR SET OF 4 SMALLER PLATTERS #3585). IT MEASURES 18 ½” LONG (END TO END) AND 8 3/8” WIDE (AT CENTER). BOTTOM IS MARKED: OVEN PROOF, 9375, USA. PLATTER IS IN SUPER CONDITION. THE ONLY FLAW/IMPERFECTION I COULD FIND IS A ¼” PRODUCTION STRESS AT END OF TAIL – THAT’S IT! THIS LISTING HAS A SET OF 3 MCCOY NESTED MIXING BOWLS! THEY ARE FROM THE PRETTY BROWN DRIP DINNERWARE LINE AND HAVE BEEN A PART OF COLLECTION FOR MANY YEARS. BOWLS ARE MARKED 7026, 7027, AND 7028, MCCOY, LANCASTER COLONY (MARK), USA. THE SMALLEST BOWL MEASURES 2 ¾” TALL, 6 ¼” DIAMETER, MIDDLE SIZE BOWL MEASURES 3 ¼” TALL, 7 ½” DIAMETER, AND THE LARGEST BOWL IS 3 ¾” TALL, 8 ½” DIAMETER. BOWLS HAVE A FEW UTENSIL MARKS (NOT UNCOMMON WITH THIS COLOR). NEAT! EXCELLENT CONDITION – STILL IN ORIGINAL BOX – MCCOY BROWN DRIP DINNERWARE! PER BOX, THIS IS A “16 PIECE STARTER SET”, SERVICE FOR FOUR”. THERE ARE 4 DINNER PLATES 4 SALAD/DESSERT PLATES, 4 SOUP/SALAD BOWLS, AND 4 CUPS. SUPER! THIS IS A NEAT MCCOY COOKIE JAR – THE HEN ON A BASKET! COOKIE JAR IS IN WONDERFUL CONDITION WITH NO “USE” EVIDENCE. 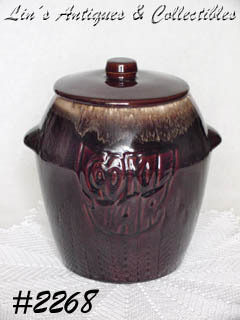 IT HAS A ½” PRODUCTION NON-COLOR/NON-GLAZE ON RIM EDGE OF JAR AND THERE IS A POTTERY “POP” ON BOTTOM (UNDERNEATH) – BOTH ARE PRODUCTION AND OF NO CONSEQUENCE. JAR IS MARKED 7110, MCCOY, LANCASTER COLONY (MARK), USA. SUPER! 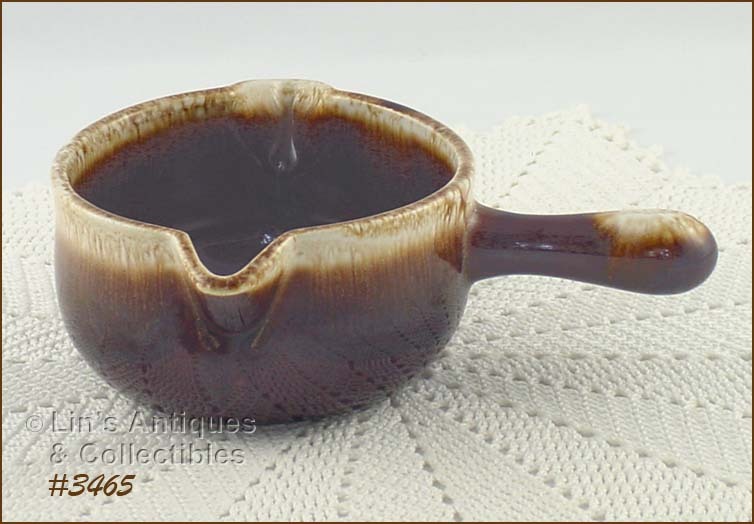 THIS IS A VERY DIFFICULT TO FIND MCCOY ITEM – A BATTER BOWL FROM THE BROWN DRIP DINNERWARE LINE! BOWL MEASURES 4 ½” TALL, 7 ¾” DIAMETER, AND BOTTOM IS MARKED MCCOY, OVENPROOF, USA. BATTER BOWLS ARE MORE DIFFICULT TO FIND WITH THE LONG HANDLE (AS OPPOSED TO THE TAB TYPE HANDLE) AND THIS BOWL HAS THE LONG HANDLE. BOWL HAS PRETTY COLOR AND IS IN EXCELLENT CONDITION. IT HAS VERY MINOR UTENSIL-LIKE MARKS IN BOTTOM BUT I BELIEVE THEY’RE JUST STORAGE MARKS BECAUSE BOWL APPEARS NEW AND UNUSED. SUPER ADDITION TO A COLLECTION! THIS LISTING HAS A MCCOY COOKIE JAR “PART”! IT’S THE LID FOR THE HEN ON A BASKET COOKIE JAR THAT WAS PRODUCED 1958-59. 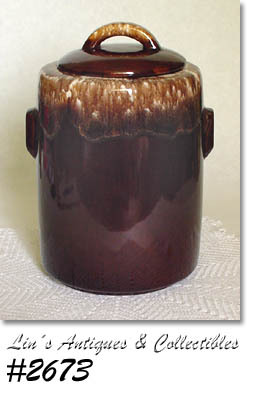 THE LID IS IN THE PRETTY BROWN DRIP COLORS (THE BASKET BOTTOM FOR THIS PARTICULAR JAR IS USUALLY CREAMY WHITE OR DARK BROWN). LID IS IN MINT CONDITION WITH NO CHIPS, CRACKS, DINGS, OR CRAZING – SUPER! WHAT A FIND – A MCCOY SPAGHETTI BOWL IN THE ORIGINAL BOX! BOWL IS FROM THE PRETTY BROWN DRIP DINNERWARE LINE, MEASURES 12 ½” DIAMETER, AND IS MARKED OVEN PROOF, USA. EXCELLENT UNUSED CONDITION – THE ORIGINAL MCCOY PAMPHLET/BOOKLET IS STILL IN THE BOX! 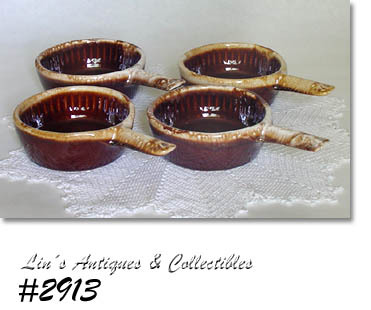 THIS LISTING HAS TWO PEDESTAL STYLE CUPS FROM MCCOY’S BROWN DRIP DINNERWARE LINE! CUPS MEASURE 4 ¼” TALL, BOTTOMS ARE MARKED 7075, MCCOY, LANCASTER COLONY (MARK), USA, AND ARE IN EXCELLENT CONDITION. PRETTY! SET OF 4 VERY DIFFICULT TO FIND MCCOY BROWN DRIP FISH PLATES! THESE MEASURE 12” LONG, 6 ¼” WIDE (AT WIDEST), AND ARE MARKED OVEN PROOF, 9374, USA. EXCELLENT CONDITION! THIS IS A VERY DIFFICULT FIND – A SERVING BOWL FROM MCCOY’S BROWN DRIP DINNERWARE LINE! BOWL MEASURES 7 5/8” DIAMETER, 2 ½” TALL AND BOTTOM IS MARKED: 1423, MCCOY, LANCASTER COLONY (MARK), USA. THE ONLY “USE” EVIDENCE ARE A FEW UTENSIL MARKS INSIDE BOTTOM! THE FINISH HAS LITTLE “BUMPS” UNDER THE GLAZE – THEY OCCURRED DURING PRODUCTION. A NEAT ITEM! 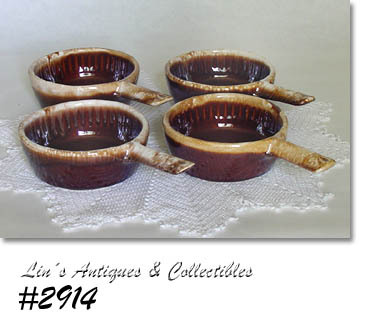 THIS LISTING HAS 6 LARGE SOUP BOWLS FROM MCCOY’S BROWN DRIP DINNERWARE LINE! BOWLS MEASURE 5 5/8” DIAMETER, 2 ¾” TALL, AND BOTTOMS ARE MARKED MCCOY (IN CIRCLE WITH LINES), LANCASTER COLONY (MARK), USA. THEY ARE IN EXCELLENT CONDITION! 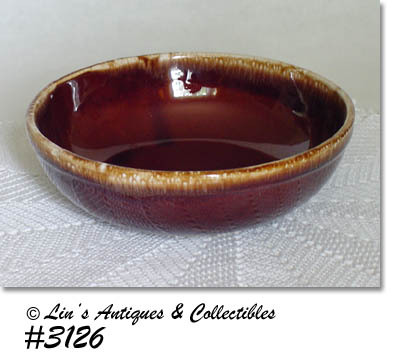 EXCELLENT CONDITION GRAVY BOWL/SERVER FROM MCCOY’S PRETTY BROWN DRIP DINNERWARE LINE! BOTTOM IS MARKED: 1428, MCCOY, LANCASTER COLONY (MARK), USA. IT HAS ABSOLUTELY NO EVIDENCE OF “USE” – LOOKS NEW! SUPER ADDITION TO A BROWN DRIP COLLECTION! Very pretty colors on these McCoy candleholders! The brown drip is a tan/white blend and the remainder is a petty tan color instead of the dark brown usually found on McCoy’s brown drip items. 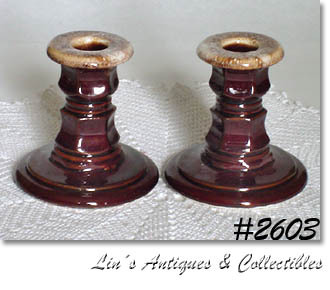 Candleholders measure 3 ½” tall and are in excellent condition. EXCELLENT CONDITION MCCOY SHAKER SET! THESE ARE THE MILK CAN SHAPE AND ARE FROM THE PRETTY BROWN DRIP LINE, MEASURE 4” TALL, MARKED USA, AND HAVE ORIGINAL PLASTIC STOPPERS. NEAT! THESE LITTLE SHELL SHAPE DISHES BY MCCOY ARE SO PRETTY AND HAVE SO MANY USES! THIS ONE HAS THE PRETTY BROWN DRIP COLOR SCHEME AND IS MARKED ON BACK: 800, MCCOY, LANCASTER COLONY (MARK), USA. IT MEASURES 5 5/8” LONG (AT LONGEST), 5” WIDE (AT CENTER), AND IS IN EXCELLENT CONDITION. DISH IS EXCELLENT (AND IS THE PERFECT SIZE!) TO USE AS A SOAP DISH, JEWELRY HOLDER, ETC. EXCELLENT CONDITION MCCOY SHAKER SET! 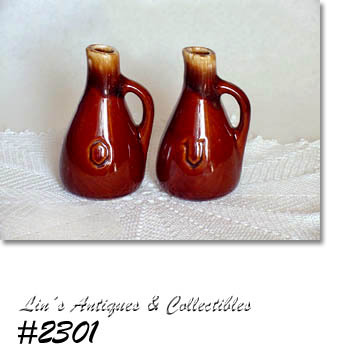 THESE ARE FROM THE PRETTY BROWN DRIP LINE AND ARE TABLE SHAKERS – MEASURE 2 ¼” TALL AND SHAPED TO FIT IN YOUR HAND. THEY HAVE THE ORIGINAL PLASTIC STOPPERS. SUPER SET! VERY NICE MCCOY SERVING BOWL FROM THE PRETTY BROWN DRIP LINE! MEASURES 2 5/8” TALL, 7 ¾” DIAMETER AND BOTTOM IS MARKED: 1423, MCCOY, LANCASTER COLONY (MARK), USA. BOWL HAS NO CHIPS OR CRACKS, HAS A FEW UTENSIL MARKS – THAT’S IT! DIFFICULT TO FIND ITEM FOR THIS LINE. 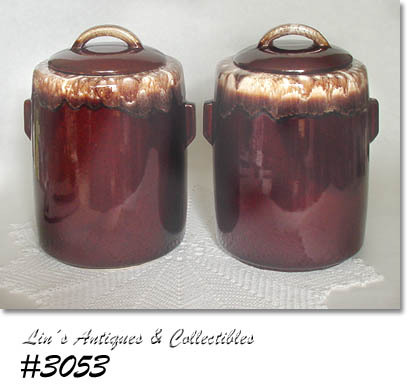 THIS LISTING IS FOR THE MORE DIFFICULT TO FIND CYLINDRICAL SHAPE MCCOY BROWN DRIP COOKIE JAR! I HAVE 2 AVAILABLE AND BOTH ARE IN EXCELLENT CONDITION AND ARE MARKED USA, 28. IF YOU HAVE A PREFERENCE WHEN ORDERING, PLEASE SPECIFY WHICH JAR (LEFT OR RIGHT) IN PHOTO. VERY PRETTY COLOR ON THIS SHAKER SET FROM MCCOY’S BROWN DRIP LINE! THESE HAVE THE LITTLE HANDLES AND AN IN-MOLD “S” & “P”. THEY’RE IN EXCELLENT CONDITION BUT DO NOT HAVE STOPPERS. MCCOY’S LARGE PITCHERS FROM THE BROWN DRIP LINE ARE RATHER DIFFICULT TO FIND – ESPECIALLY IN GOOD CONDITION! THIS ONE IS IN WONDERFUL CONDITION WITH NO CHIPS, NO CRACKS, OR CRAZING. MEASURES 8” TALL, MARKED ON BOTTOM: MCCOY, LANCASTER COLONY (MARK), USA AND HAS VERY PRETTY COLORS! THIS IS A VERY NICE AND DIFFICULT TO FIND MCCOY DINNERWARE ITEM! FROM THE PRETTY BROWN DRIP LINE, THIS IS A COVERED MARGARINE CONTAINER (WOULD ALSO BE A GREAT CANDY DISH). 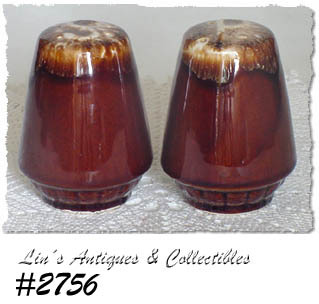 MEASURES 2 ¾” TALL (BOTTOM), 4 ¾” TALL TO TOP OF KNOB TYPE HANDLE AND IS 4 7/8” DIAMETER. MARKED: MCCOY, LANCASTER COLONY (MARK), USA. EXCELLENT CONDITION – NO CHIPS, NO CRACKS, NO CRAZING! ANOTHER SET OF MCCOY BROWN DRIP CASSEROLES! THESE ARE THE INDIVIDUAL SIZE AND ARE MARKED: 874, MCCOY, LANCASTER COLONY (MARK), USA. SET LOOKS NEW AND UNUSED, ONE HANDLE HAS A PRODUCTION STRESS – THAT’S IT! THIS STYLE IS NOT EASILY FOUND IN THE BROWN DRIP. SUPER NICE INDIVIDUAL SIZE CASSEROLES FROM MCCOY’S BROWN DRIP LINE! MARKED ON BOTTOM: 874, MCCOY, LANCASTER COLONY (MARK), USA. CASSEROLES APPEAR TO HAVE NEVER BEEN USED! PRETTY COLORS ON THIS MCCOY CHEESE SHAKER! 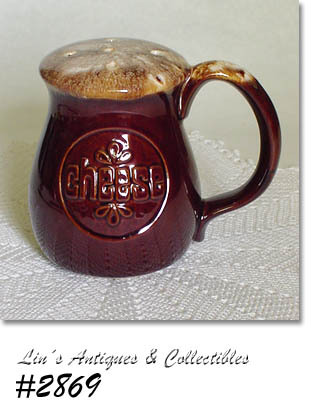 LARGE SHAKER WITH HANDLE MEASURES 4 ¾” TALL, 3 ½” DIAMETER AT TOP, AND HAS IN-MOLD “CHEESE” ON BOTH SIDES. EXCELLENT CONDITION BUT HAS LOST ITS PLASTIC STOPPER. THESE SHAKERS ARE DIFFICULT TO FIND IN THE BROWN DRIP LINE! 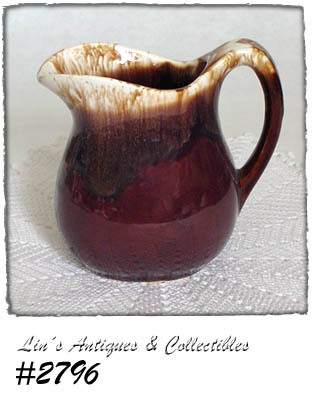 ANOTHER PRETTY MCCOY BROWN DRIP ITEM – A PITCHER! MEASURES 6” TALL, MARKED ON BOTTOM: MCCOY, LANCASTER COLONY (MARK), USA. EXCELLENT CONDITION! 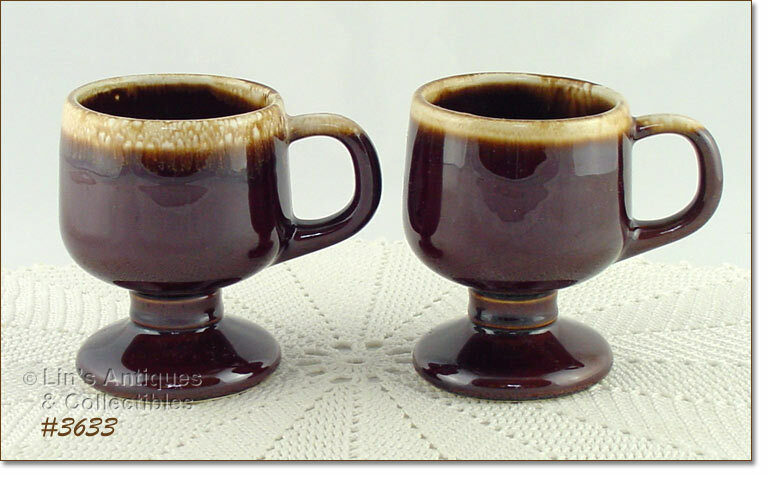 DIFFICULT TO FIND MCCOY ITEMS – SET OF 4 TALL MUGS FROM THE PRETTY BROWN DRIP LINE! MEASURE 5” TALL, MARKED ON BOTTOMS: MCCOY, LANCASTER COLONY (MARK), USA. EXCELLENT CONDITION – LOOK NEW AND UNUSED!! LARGE SIZE COVERED CASSEROLE FROM MCCOY’S BROWN DRIP LINE! MEASURES 10” DIAMETER, 4 ¾” TALL (TO RIM), AND IS MARKED ON BOTTOM: 7076, USA, MCCOY (IN CIRCLE WITH LINES), OVEN PROOF. EXCELLENT CONDITION AND VERY PRETTY COLOR! NEAT MCCOY PITCHER FROM THE BROWN DRIP LINE! 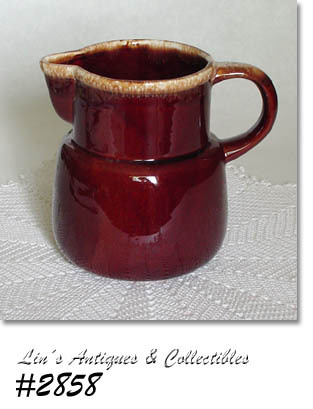 PITCHER IS THE PERFECT SIZE FOR SYRUP -- MEASURES 5 1/4" TALL (AT TALLEST). MARKED ON BOTTOM: USA. IN VERY GOOD CONDITION -- HAS A 3/16" GLAZE CHIP ON UNDERSIDE OF POUR LIP -- THAT'S IT! PRETTY MCCOY SHAKER SET! THESE ARE FROM THE BROWN DRIP LINE -- THEY'RE A WARM BROWN COLOR WITH TAN/WHITE "DRIP" ON TOPS. MEASURE 3 3/4" TALL AND HAVE A GREAT SHAPE TO FIT INTO YOUR HAND! IN EXCELLENT CONDITION WITH NO CHIPS, NO CRACKS, NO CRAZING! THEY DO NOT HAVE STOPPERS. VERY NICE MCCOY COOKIE JAR! THIS ONE IS IN THE PRETTY BROWN DRIP COLORS AND IS IN THE DIFFICULT TO FIND CYLINDRICAL SHAPE. MEASURES 10 1/4" TALL (BOTTOM TO TOP OF LID'S HANDLE), MARKED ON BOTTOM: USA, 28. JAR HAS VERY PRETTY "DRIP" AND IS IN WONDERFUL CONDITION -- THE ONLY EVIDENCE OF "USE" I COULD FIND IS A 5/8" SLICE TYPE CHIP ON INSIDE INNER RIM OF LID -- THAT'S IT! VERY NICE MCCOY CRUET! THIS IS THE VINEGAR CRUET AND IS FROM THE BROWN DRIP LINE. MEASURES 5" TALL (AT TALLEST) AND IS IN A WARM BROWN COLOR WITH PRETTY "DRIP". EXCELLENT CONDITION -- NO CHIPS OR CRACKS! VERY NICE MCCOY PITCHER FROM THE BROWN DRIP LINE! MEASURES 8" TALL, MARKED ON BOTTOM: 37, USA. 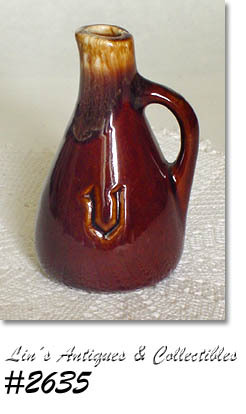 THIS SHAPE PITCHER IS SELDOM FOUND IN THE BROWN DRIP -- IT IS COMMON IN BLUE WILLOW LINE BUT NOT IN MCCOY'S OTHER DINNERWARE LINES. MINT CONDITION -- NO CHIPS, NO CRACKS, NO CRAZING -- EXCELLENT! BEAUTIFUL CANDLEHOLDERS FROM MCCOY'S BROWN DRIP LINE! 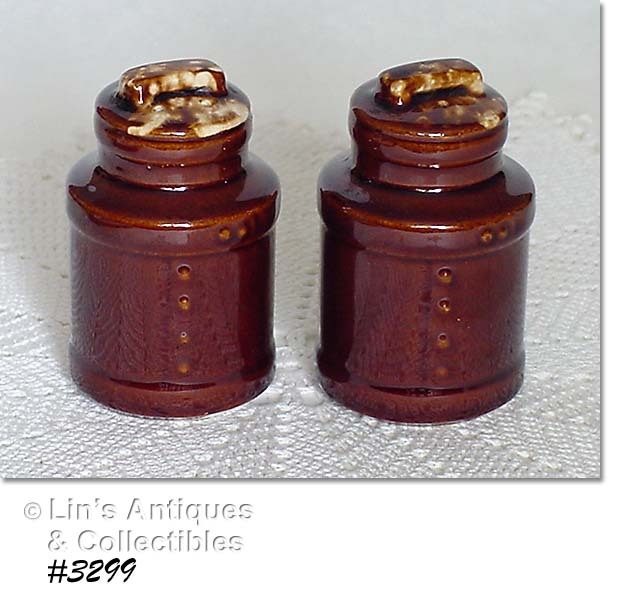 MEASURE 3 3/4" TALL AND ARE A WARM BROWN COLOR WITH "FOAMY DRIP" ON TOP AND ALL OVER SHINY GLAZE. EXCELLENT CONDITION -- NO CHIPS, NO CRACKS, NO CRAZING! VERY NICE ADDITION TO A BROWN DRIP COLLECTION. EXCELLENT COMPLETER ITEMS FOR MCCOY BROWN DRIP DINNERWARE! LISTING CONSISTS OF A PLATTER (14" LONG, 10 3/16" WIDE) AND A DIVIDED VEGETABLE BOWL (11 1/4" LONG, 8" WIDE). BOTH ARE UNMARKED AND ARE IN WONDERFUL CONDITION -- BOWL HAS A SMALL (1/8") DING ON BOTTOM DRY (SETTING) RING AND PLATTER HAS MINOR UTENSIL MARKS -- THAT'S IT! 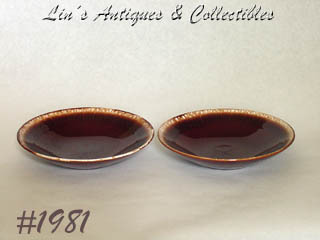 THIS LISTING HAS TWO SERVING BOWLS FROM MCCOY'S FUTURA LINE! 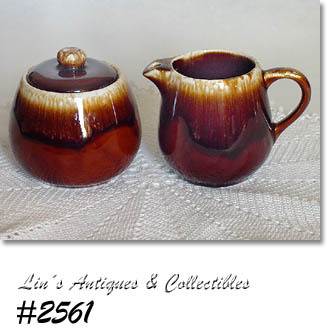 THE BROWN DRIP COLORS ARE EXCEPTIONAL -- ONE IS DARK BROWN WITH FOAMY "DRIP", THE OTHER IS A WARM BROWN COLOR, BOTH HAVE SHINY GLAZE. MEASURE 8 3/4" DIAMETER, 2 1/2" TALL. THE DARK BROWN BOWL HAS A PRODUCTION NON-COLOR/GLAZE ON RIM EDGE AND BOTH HAVE A COUPLE INTERIOR UTENSIL MARKS -- THAT'S IT! VERY NICE ADDITION TO A BROWN DRIP DINNER SERVICE. VERY NICE MCCOY ITEM THAT IS NOT AN EVERYDAY FIND! FROM THE PRETTY BROWN DRIP LINE, CREAMER MEASURES 4 5/8" TALL AND HAS MCCOY'S PITCHER LOGO, USA ON BOTTOM. ALTHOUGH THIS IS A CREAMER, IT IS TALL ENOUGH TO BE USED FOR SYRUP! EXCELLENT CONDITION WITH NO CHIPS, NO CRACKS, NO CRAZING. ANOTHER NICE LISTING FROM MCCOY'S PRETTY BROWN DRIP LINE! THESE ARE THE MORE ROUND SHAPE -- SUGAR HAS MCCOY'S PITCHER MARK, USA, MCP WHILE CREAMER IS MARKED USA. BOTH HAVE PRETTY COLOR AND "DRIP" WITH SHINY GLAZE. IN EXCELLENT CONDITION -- CREAMER HAS A 1/4" SLICE TYPE CHIP ON DRY (SETTING) RING -- IT'S PRODUCTION AND THE CHIP IS FIRED ONTO THE BOTTOM! NEAT ITEMS. 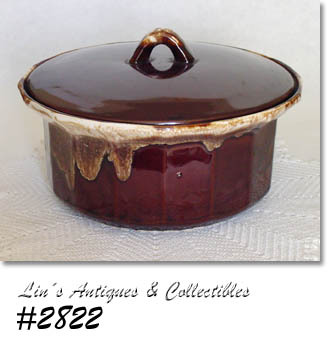 THIS LISTING HAS 6 MCCOY AU GRATINS FROM THE PRETTY BROWN DRIP LINE! THEY ARE THE LARGER SIZE -- 10 1/2" LONG FROM TAB HANDLE TO TAB HANDLE, 5" WIDE, 1 3/4" TALL. IN EXCELLENT CONDITION -- NO CHIPS, NO CRACKS! CUTE MCCOY SALT AND PEPPER SHAKER SET! THESE ARE SHAPED LIKE MILK CANS AND ARE FROM MCCOY'S PRETTY BROWN DRIP LINE. 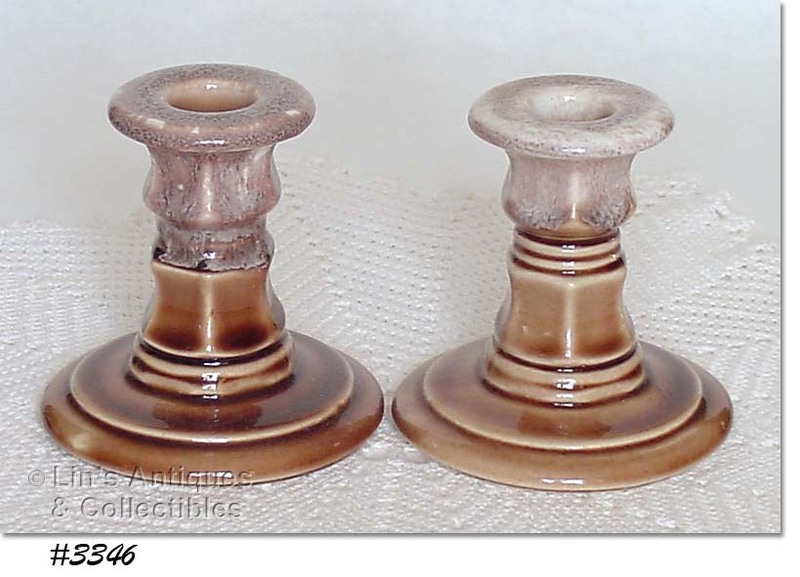 THEY MEASURE 3 3/4" TALL AND HAVE BEAUTIFUL COLORS -- WARM BROWN WITH WHITE "DRIP". THE DRIP IS VERY CAREFULLY APPLIED TO ONLY THE "LID" OF THE MILK CAN SHAPE -- DOES NOT DRIP DOWN THE SIDES! SHAKERS ARE IN EXCELLENT CONDITION -- ONE HAS A TEENY DING AT BASE/DRY RING AND THE OTHER HAS A FLAKE OFF AT THE FILL OPENING. NEITHER ARE OF ANY CONSEQUENCE. BOTH HAVE ORIGINAL PLASTIC STOPPERS. PRETTY SET! VERY NICE MCCOY SHAKER SET FROM THE BROWN DRIP DINNERWARE LINE! 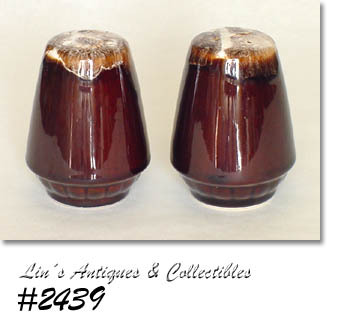 SHAKERS MEASURE 3 3/4" TALL, ARE THE DARK BROWN COLOR AND "FROTH" ON TOPS IS LIGHT TAN WITH WHITE. SET LOOKS NEW AND UNUSED BUT DOESN'T HAVE STOPPERS. VERY PRETTY UNMARKED MCCOY CRUET SET! 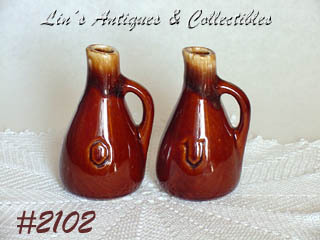 VINEGAR AND OIL SET ARE FROM THE PRETTY BROWN DRIP LINE AND THESE ARE IN THE WARM BROWN COLOR WITH SHINY GLAZE. THEY MEASURE 5 1/8" TALL. IN WONDERFUL CONDITION -- THERE IS A 1/4" VERTICAL GLAZE BREAK ON ONE SIDE OF THE VINEGAR'S HANDLE -- THAT'S IT! NICE SET. 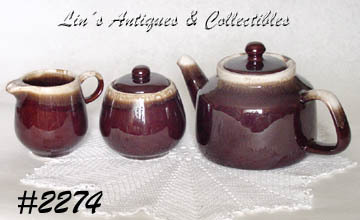 EXCELLENT MCCOY TEA POT, CREAMER, AND COVERED SUGAR FROM THE PRETTY BROWN DRIP LINE! TEA POT IS MARKED ON BOTTOM: 163, MCCOY, LANCASTER COLONY (MARK). 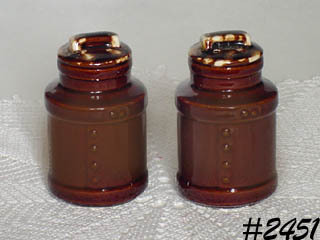 SUGAR WITH LID AND CREAMER ARE MARKED ON BOTTOMS: 7020, MCCOY, USA. THE ONLY BLEMISH I COULD FIND IS A SMALL GLAZE FLAKE-OFF ON BOTTOM OF TEA POT (BY DRY SETTING RING) -- OF ABSOLUTELY NO CONSEQUENCE AND REALLY NOT WORTHY OF MENTION! SET LOOKS NEW AND UNUSED. EXCEPTIONAL CONDITION MCCOY COOKIE JAR FROM THE PRETTY BROWN DRIP LINE! HAS IN-MOLD "COOKIE JAR" ON FRONT AND BACK. MARKED ON BOTTOM: 7024. NO CHIPS, NO CRACKS, NO CRAZING! VERY NICE JAR. PRETTY MCCOY VINEGAR AND OIL CRUETS FROM THE BROWN DRIP LINE! THIS SET IS IN THE WARM BROWN COLOR (NOT THE DARK BROWN) AND HAS PRETTY DRIP THAT IS MORE LIGHT TAN THAN WHITE. EXCELLENT CONDITION -- NO CHIPS, NO CRACKS, NO CRAZING! ANOTHER MCCOY CHOP PLATE FROM THE BROWN DRIP LINE! CHARGER MEASURES 12 1/4" DIAMETER. HAS SOME UTENSIL MARKS AND A 1/16" DING ON RIM EDGE -- OF NO CONSEQUENCE! VERY NICE. DIFFICULT TO FIND MCCOY ITEM -- THIS IS A CHOP PLATE FROM THE BROWN DRIP LINE! MEASURES 12 1/4" DIAMETER AND IS IN GREAT SHAPE -- HAS FEW UTENSIL MARKS (NOT UNCOMMON) AND A COUPLE CHIPS ON BOTTOM DRY (SETTING) RING THAT ARE OF NO CONSEQUENCE! THIS IS A NICE ADDITION TO A BROWN DRIP DINNERWARE COLLECTION. 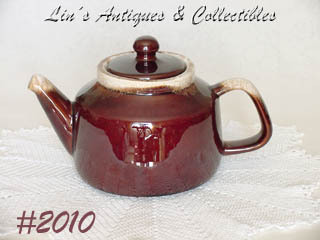 EXCELLENT CONDITION MCCOY TEA POT IN THE PRETTY BROWN DRIP COLORS! MEASURES 4 5/8" TALL TO RIM, 5 3/4" TALL TO TOP OF KNOB HANDLE. MARKED ON BOTTOM: 163, MCCOY, LANCASTER COLONY (MARK), USA. ONLY EVIDENCE OF USE IS A LIGHT GLAZE SCRATCH ON SIDE -- OF ABSOLUTELY NO CONSEQUENCE! TEA POT DOESN'T APPEAR TO HAVE BEEN USED. VERY NICE. WHAT A FIND! 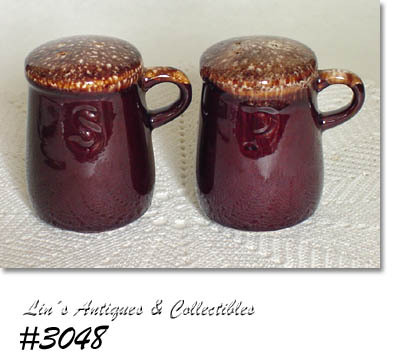 THIS IS A MCCOY TOOTHBRUSH HOLDER, MUG SHAPED AND IN THE VERY PRETTY BROWN DRIP COLORS. CAN HOLD UP TO 6 TOOTHBRUSHES AND CENTER HOLDS THE TOOTHPASTE. MEASURES 3 1/2" TALL, 3 3/4" DIAMETER. MARKED: MCCOY, 801, LANCASTER COLONY (MARK), USA. MINT CONDITION -- NO CHIPS, NO CRACKS, NO CRAZING -- WOW!!! A RARE FIND -- MCCOY BROWN DRIP SAUCERS! I ONLY HAVE 3 OF THESE, THEY ARE FROM THE FUTURA LINE (NOT AS HEAVY), AND ARE MARKED USA. THEY HAVE STILT MARKS (NORMAL) AND EACH HAS A SMALL GLAZE DING ON UNDERSIDE OF SAUCER RIM. VERY PRETTY ITEMS. 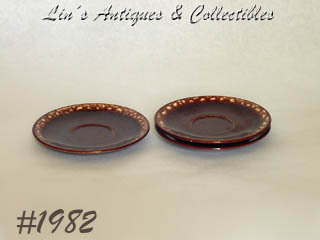 ANOTHER MCCOY BROWN DRIP DINNERWARE LISTING! THESE ARE FROM MCCOY'S FUTURA LINE -- SAME PRETTY BROWN DRIP BUT NOT AS HEAVY AS THE BROWN DRIP ITEMS. THERE ARE 2 SOUP OR SERVING BOWLS IN THIS LISTING. GREAT CONDITION -- MINOR UTENSIL MARKS.